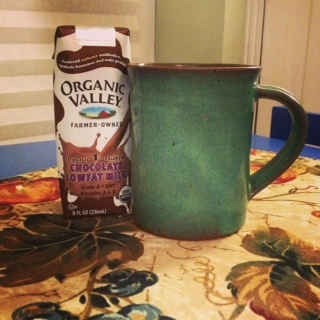 Why yes, yes I did just squeeze chocolate milk from my son’s drink box into my coffee. Yes, he is drinking chocolate milk for breakfast. We, um, ran out of milk yesterday. Not just skim milk or 2%, but all of it. Out completely. I somehow managed to take my son to the zoo, cook dinner for the next three nights, turn out two loads of laundry and race off to a work function. But I completely failed to remember we were out of milk. Oh, it gets worse. In the pantry, I’ve scared up a couple drink boxes of organic milk that inexplicably require no refrigeration. The chocolate ones are a treat we restock regularly. The white one must have been leftover from Super Storm Sandy, back when I laid in non-perishables. A relic of the days when I was an attentive mother. Apparently, those do have an eventual expiration. Thank God I tried to pilfer milk from the Robin’s cup first, and noticed the white milk tumbling out in chunks. It is enough to make me vegan. Last week was a big end-of-year potluck at Robin’s Preschool. I have coordinated the last two class potlucks, so I was almost relieved to have a conflict for this one. Still I was able to swing a work-at-home day so I could at least catch the Preschool Show before slipping off to an evening computer class. I could kiss my boys, see Robin’s turn in the Orange Room skit and pass off the family dish. I brought baked beans. Not homemade. Not even organic. 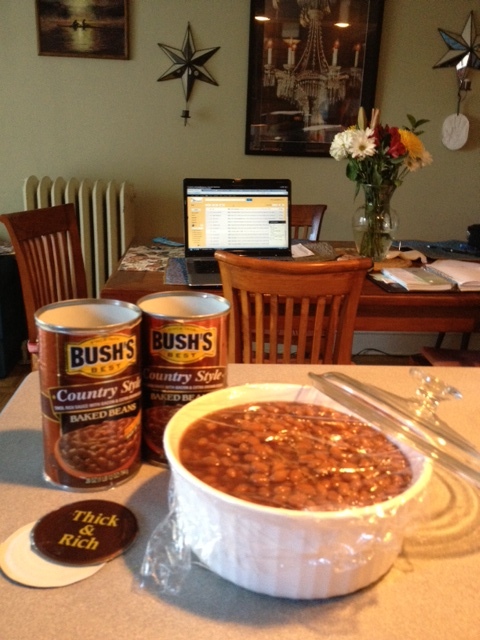 At 4:45 that day, I opened two large cans of Bush’s beans and dumped them into a covered dish just before powering down the laptop and driving up to school to meet the family for the 5pm show. Two pounds of canned goods from the Acme. A heaping Corningware dish of processed food, one of Robin’s favorites. In the last three years I have carted crock pots of homemade veggie chili to school, sent fresh baked apple muffins for birthdays–sweetened with honey, not sugar. I’ve made my grandma’s halushka for a family heritage lunch and turned out a small vegan batch for a classmate with dietary restrictions. I’ve carved cantaloupes and frosted sugar cookies to share, steamed epic amounts of broccoli that rendered the car interior noxious on the short drive to school. I’ve lost countless markers and plastic serving spoons in the process. I chuckled to myself at a potluck a couple years back when a parent who had signed up to bring macaroni and cheese walked in with a crock full of Kraft. But you know what? It went! The bowl was picked clean while my homemade hummus crusted over on a table nearby. I’d like to say it was this sort of pragmatism that motivated me. But really, I am just lazy and willing to surrender to LCD eating now and then. Beans please the masses, as evidenced by the nearly empty bowl I found waiting for me in the kitchen when I returned from class. As I scraped the leftovers into a container and lifted the spoon to lick it, I was horrified to notice the chunks of meat. Apparently in my haste, I didn’t even have the decency to read the label and select vegetarian beans. Call me Mother of the Year. This entry was posted in Food and tagged food convenience lazy mom on June 15, 2013 by aszyper.